Ettalong Diggers offers inclusive packages for weddings, parties and pretty much anything! 1. Beaches are still the most popular settings for events and functions. Sun, surf, gorgeous sunrises, afternoons with stunning sunsets, ocean views for as far as the eye can see, and even dramatic rolling clouds….that’s the backdrop at Ettalong Diggers. 2. We have the flexibility to offer you a unique and memorable experience on your special day. Ettalong Diggers can cater for a function of any size up to 900 people. 3. In order to achieve epic party greatness, our staff will ensure that you actually enjoy your event by putting you at ease. Our team will thoughtfully address each and every detail, and satisfy every need and desire you and your guests have. 4. From concept to creation. The decorations and themes we can create are as endless as your imagination. 5. Formal dinners or chilled out cocktail parties – and everything in between. Our award winning catering team will work with you and be flexible with your budget. Whether you are graduating or celebrating your end of session achievements we have the perfect package for you! What a backdrop for your school formal photos! The longest view over Broken Bay, Lion Island and glistening ocean all the way to Palm Beach. It's a spectacular setting for a milestone evening and our award winning food makes your night even more special. But there's a lot of organising to be done before the memories are made, so talk to our very experienced Event Managers. They know all the secrets to creating a truly wonderful celebration. At this difficult time you can rely on our professional team to organise this delicate event in a personal and intimate setting, to ensure the memory of your loved one is honoured with respect and consideration. Mark this milestone with a meaningful celebration fit for a prince or princess! 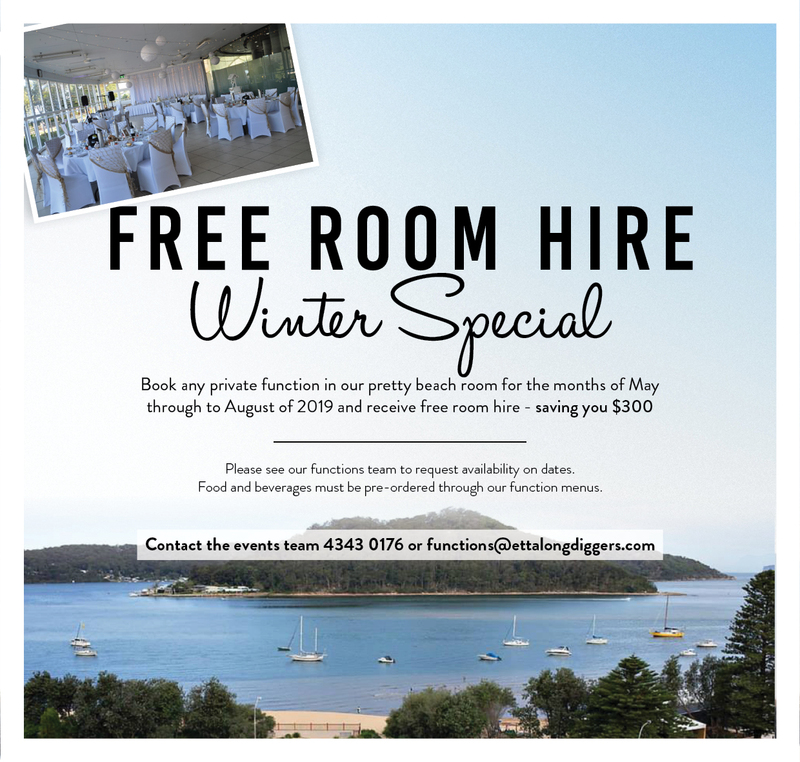 From product launches to yoga classes, Ettalong Diggers welcomes you to host your own unique event – we will assist you in creating a tailored package that brings your concept to life.